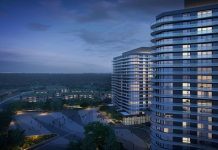 A new office condominium tower is slated for construction in Mississauga. The Red Diamond Corporate Centre has been designed to be the first LEED Gold office condominium space in the area and the only condominium office tower. Located on Export Blvd. and fronting Derry Rd., the tower is located in an employment area with a mix of commercial industrial and a large area of undeveloped land and offers easy access to both the 407 and 410 highways. Public transit already serves the area. He says this model of development inspires greater confidence from financial institutions, an important consideration as the condo is attracting many smaller users/ investors who are interested in the opportunity to own space. Office spaces may be as small as 1,000 sq. ft. and up to full floors of 16,356 sq. ft. 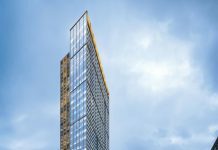 The six-storey, Class A tower is being constructed on 2.29 acres of land and will include 92,506 sq. ft. of rentable space. One level of underground parking with 110 stalls plus surface parking will provide four stalls per 1,000 sq. ft. of rentable space. The condominium’s ground floor is expected to house food services and health related services to serve both the building’s occupants and the neighbourhood. The second floor of the tower’s design overlooks the building’s lobby atrium. Construction is expected to begin in the spring of 2015 with tenant retrofits and move- ins commencing by the summer of 2016.